This project provided the conversion of intersection of NYS Route 206 and CR 39 to a single lane turnabout. Shumaker Consulting Engineering & Land Surveying, P.C. provided Survey, Mapping and ROW tasks in support of the design effort for the reconstruction of NYS Routes 7 & 206 and for the replacement of the NYS Route 206 Bridge over the Susquehanna River. SCE was responsible for preliminary highway alternatives including two signalized intersection layouts and a modern roundabout layout for the Route 206 and CR 39 Intersection. All designs were performed in accordance with NYSDOT, AASHTO, and FHWA design criteria. Preliminary design involved all aspects of preliminary highway design, traffic and capacity analysis, and M&PT detour route analysis including temporary traffic signals. SCE was responsible for all final highway designs for the selected alternative in Phases V&VI. 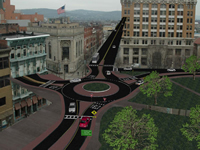 This project will provide full-depth reconstruction of Court Street in downtown Binghamton, NY. Shumaker Consulting Engineering & Land Surveying, P.C. (SCE) is providing professional services for the design and construction of this project. To date, completed tasks include: survey/mapping, traffic analysis, environmental review, and public participation tasks. Currently, SCE is developing design alternatives for roadway improvements and a proposed roundabout. SCE has initiated and performed a traffic study to collect and evaluate existing and forecasted traffic data on Court Street at twelve (12) intersections, including eight (8) signalized intersections; utilizing Highway Capacity Manual and SYNCHRO software to perform capacity and level of service analysis; evaluate accident records for the last three years, prepare collision diagrams and summary sheets to identify accident clusters or patterns. The project team has been actively engaged in soliciting public participation for this project. A number of strategic public displays and meetings have yielded important input and comments from participating stakeholders. The scope of services for this Gateway project includes streetscape changes, median treatments where feasible, pedestrian & bicycle accommodations, possible changes in parking and traffic signal upgrades. 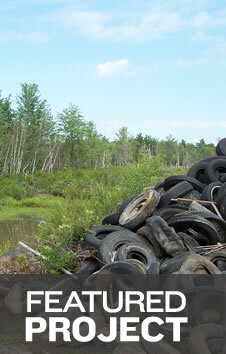 Environmental services include a SEQR review and an investigation in conformance with SHPO Phase I requirements.